Our 32 sqm Superior Rooms feature complimentary high-speed Wi-Fi, Wi-Fi music connectivity, tea & coffee making facilities and a bathroom with separated bathtub and rain shower. A genuine urban escape from the hustle and bustle of the teeming metropolis our contemporarily-designed Superior Rooms instantly make you feel at home with full-length floor-to-ceiling windows, bamboo flooring and a range of complimentary C.O. Bigelow bath and skincare amenities for that all-important personal pampering. 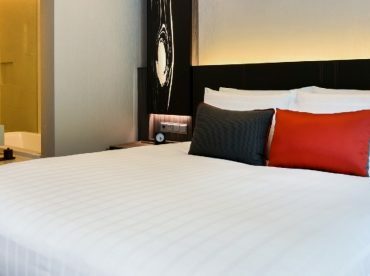 Superior Room guests also receive 10% and 20% discount vouchers to use at the King Power Duty Free Complex adjacent to this Bangkok city hotel.